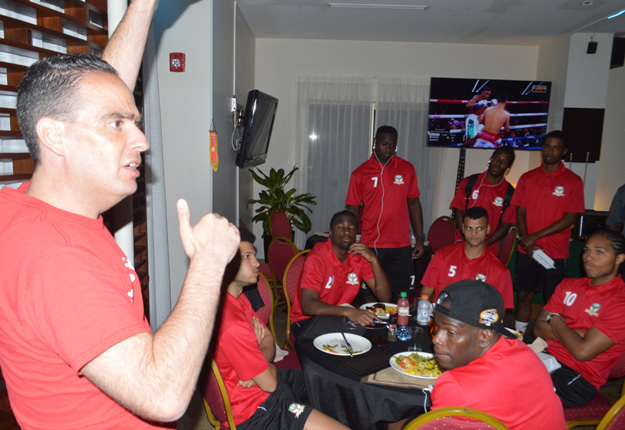 Coach Jacques Passy addresses team members at the team hotel, the Marriott Courtyard in Paramaribo, Suriname after their match on Saturday. Despite a valiant effort from the Sugar Boys, the St. Kitts and Nevis Senior Men’s National Team fell down 2-0 to Suriname at the Andre Kamperveen Stadium on Saturday night, March 23, 2019 in the Suriname capital of Paramaribo. Stefano Rijssel scored the first goal in the first half and Ivenzo Convalius sealed the deal in the 78th minute for the host side. The loss was a tough one for St. Kitts and Nevis, as this means they will miss out on qualifying for the CONCACAF Gold Cup this summer, which was poised to be a historic feat.